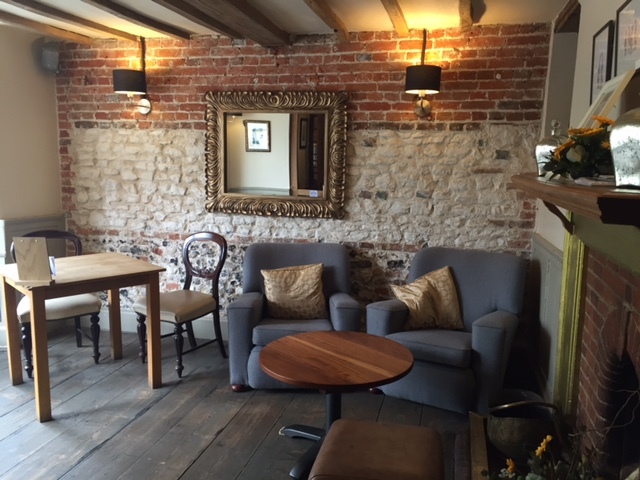 Even if you’ve never eaten at The Miller of Mansfield in the pretty riverside village of Goring, you may well have heard of it by now – this elegant 18th century country inn won Best Destination Pub in the Muddy Awards 2016, to add to the Waitrose Good Food Guide Restaurant of the Year award it collected earlier this year. 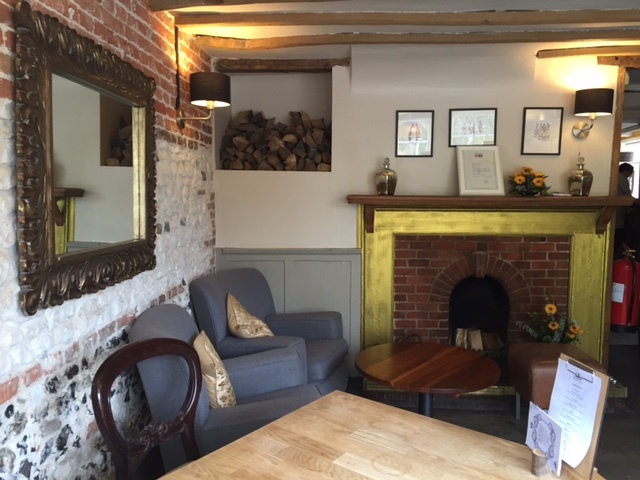 I first reviewed the restaurant back in early 2015 when husband and wife team Mary and Nick Galer had recently taken over, having previously run the Fleur de Lys pub in Dorchester. 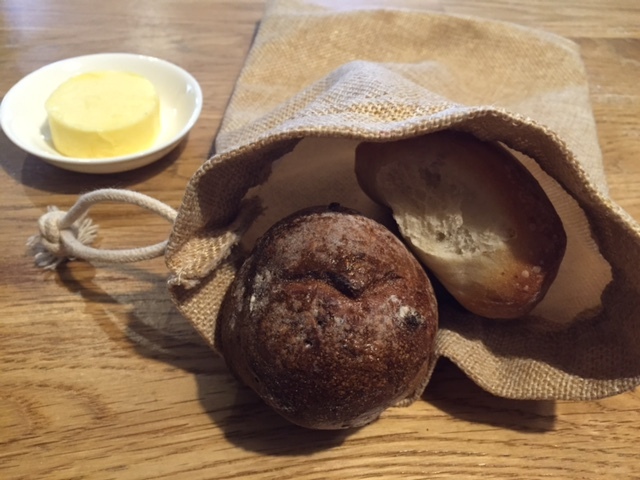 Nick had previous fine dining form at the Michelin-starred The Goose at Britwell Salome (now The Red Lion), and then in Bray as Heston Blumenthal’s head chef at The Crown. So it’s fair to say the CV wasn’t too shabby. 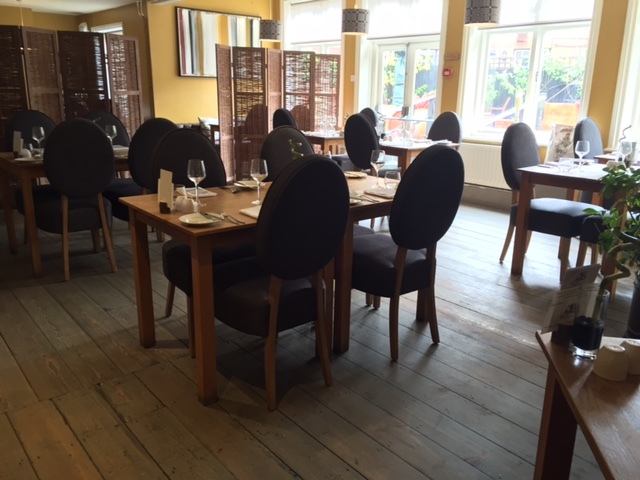 Back then the food was fab, furnishings welcoming and comfy and the restaurant quiet mid-week in the day. In some ways I suppose this review offers up some of the same conclusions, except there’s a greater confidence that comes from Awards bestowed and also a business grown into. 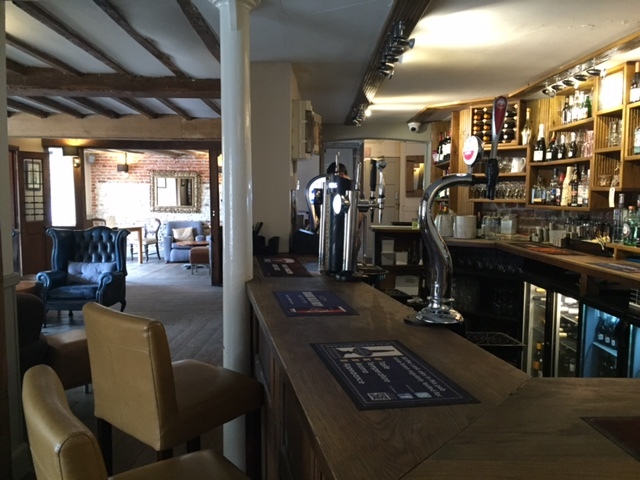 The ‘inn’ side of the business is growing, with 13 recently refurbed bedrooms, and the bar/restaurant does well on busy weekends and evenings. If you don’t already know Goring, it’s well worth a little pootle down that way to see this pretty, well-heeled village with fantastic walks a plenty, either following the river, or wandering across to neighbouring Streatley (Pierreponts and The Boat both cool cafes down that way). 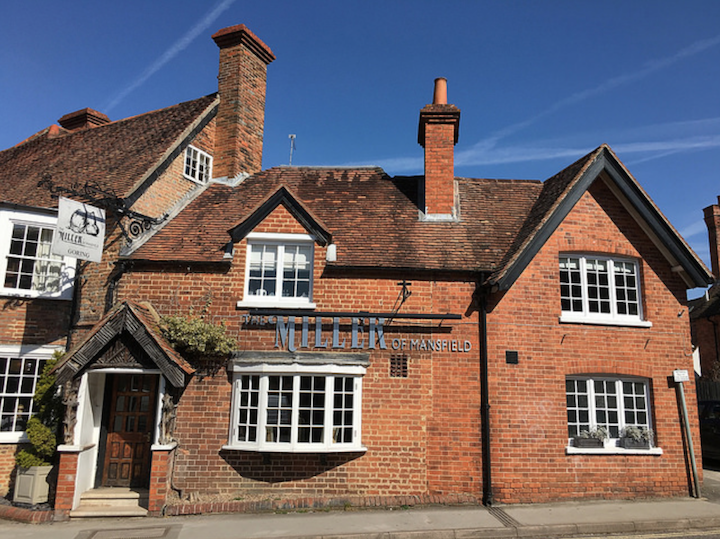 The red-brick Miller of Mansfield stretches around the corner of the main village road, handsome rather than pretty, with a relaxed vibe in the main bar and pub areas. 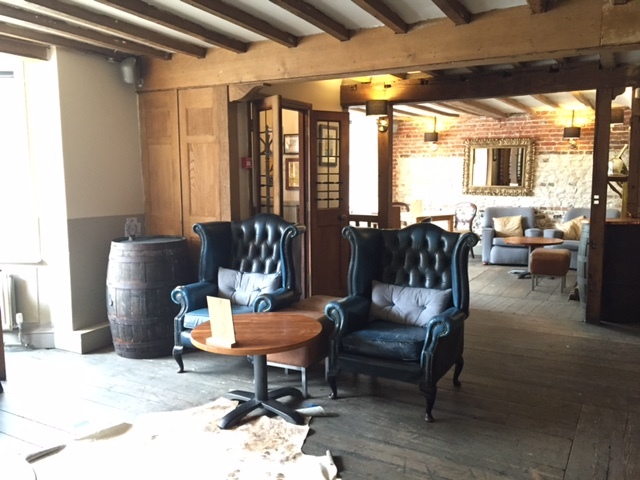 I very much like how this area has been kitted out, is natural attributes of log fires, wooden floors and exposed brickwork accentuated by eclectic furnishings. 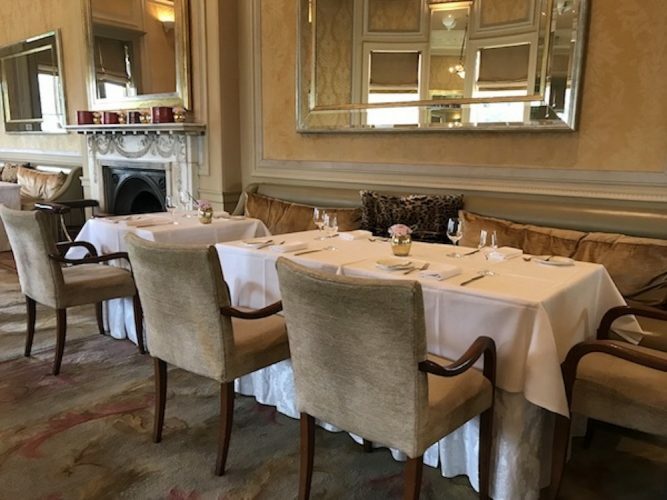 The restaurant feels more formal, though not in a particularly ‘stiff’ way – no tablecloths for starters and it’s light and open plan. More that the seats are plushly paddded, service is professional, and it is such a contrast to the much more informal ‘pubby’ bit next door. And the food. Ah well, the food is excellent. 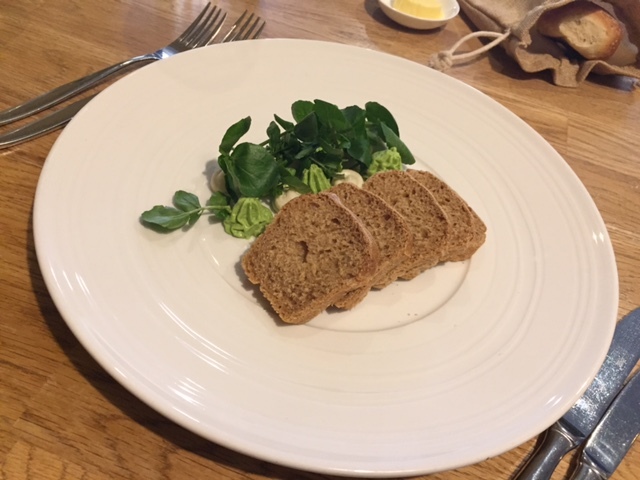 I started with Almond Tarator with watercress salad and beer bread. Never had tarator before and I’ll admit it now, I had to look it up quickly on the phone before ordering – basically it’s finely ground almonds with garlic, olive oil and lemon that creates a creamy sauce or topping. Delicious on bread, I can vouch for that. 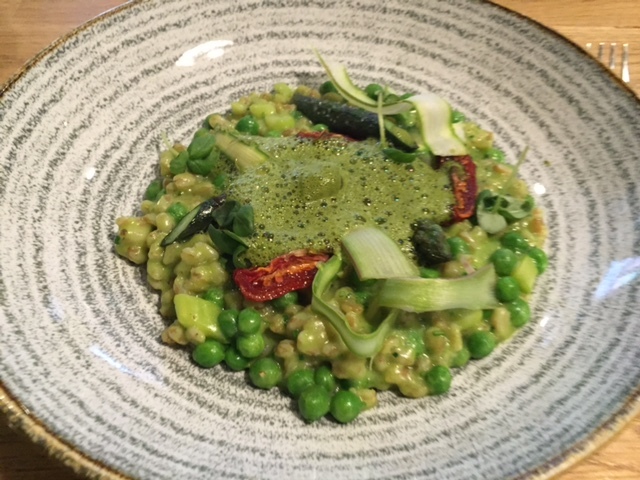 For mains, I went for an asparagus and pea spelt risotto with confit tomato and basil. Less stodgy than a normal risotto, felt a bit healthier too, with the asparagus and peas lovely and crunchy and the tomatoes doing something gastromically X-rated to my palate that science or possibly AA Gill could explain but I’d better not try. Presentation, as you can see, was fabulous. 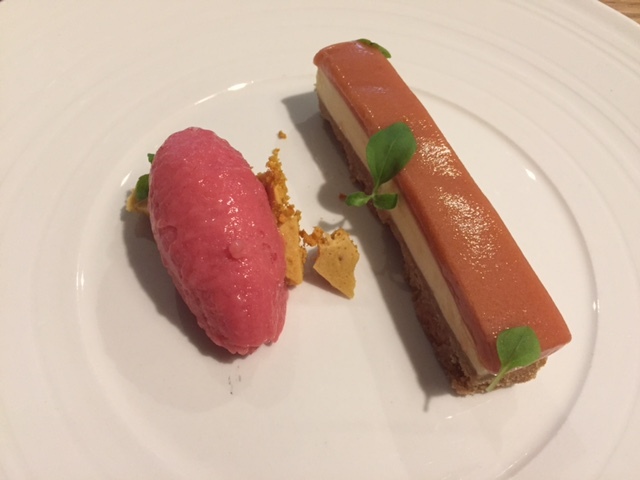 Perhaps the white chocolate and rhubarb cheesecake with rhubarb sorbet (which, OMG, was amazing) didn’t reach the same heights visually, but the sweet and sour combo was a perfect mouthful, and there was a homemade honeycomb that I nearly fainted over. 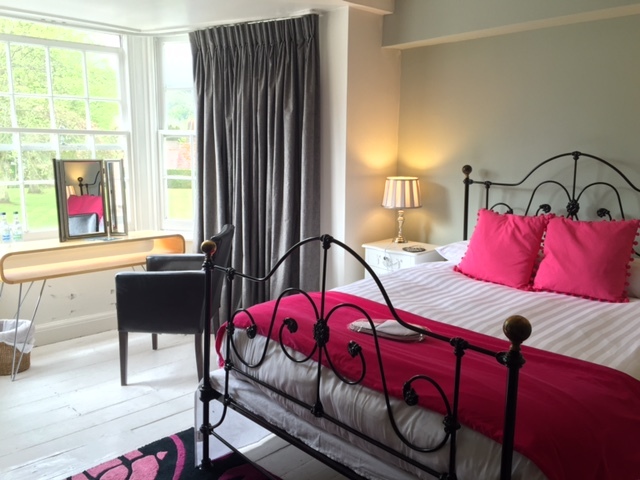 Overall, a really fantastic meal in an elegant, professionally run inn, in a pretty village. 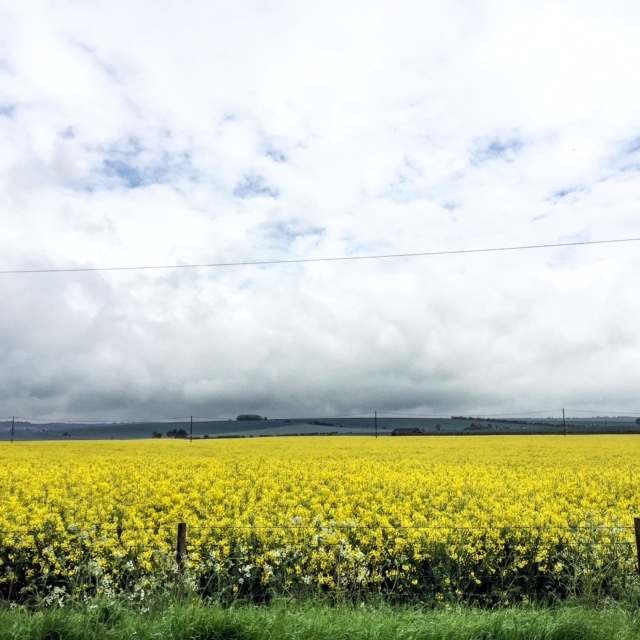 Even the drive home was beautiful – fields and fields like this against wide skies. I had to stop the car and instagram it! 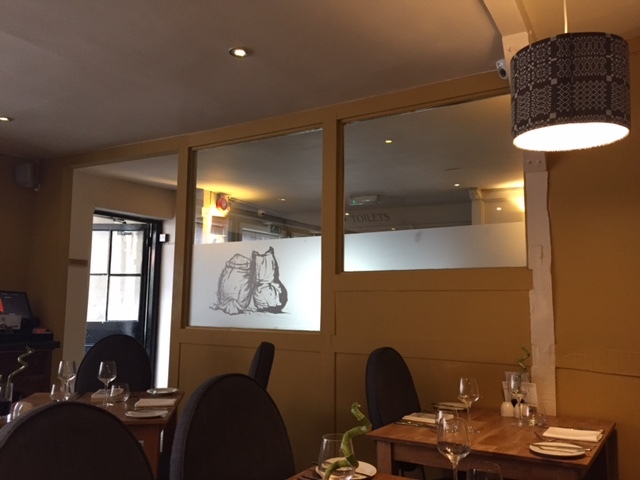 Good for: local nibblers/drinkers (there’s a nibbles menu for the snug/bar/pub bit), relaxed business lunches, girly catch-ups over excellent restaurant fare, weekend walkers, family Sunday roast lovers (they have a great local rep). 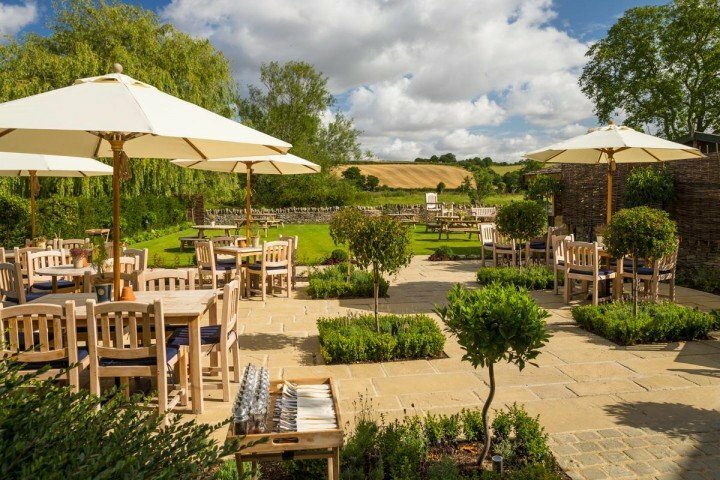 There’s a lovely recently refurbed outdoor enclosed courtyard off the restaurant that’s a boon on summer days and a space for kids to take time out. Anyone looking for a good value set lunch – in the week it’s £16 for two courses and £20 for three. A good option for private parties and family gatherings with the 13 bedrooms here too. Not for: Those looking for a superbuzzy, city-style lunch venue. You’re in Goring, it’s quiet! 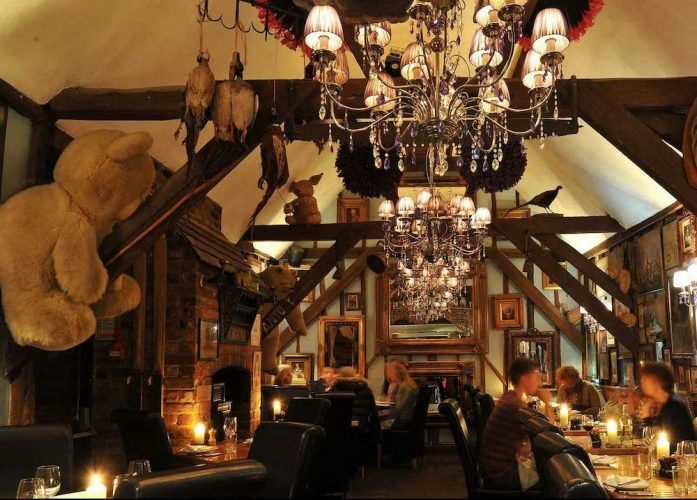 Pub classics are conspicuously absent – the Miller of Mansfield is not pretending to be anything other than a restaurant. Young children will struggle with the grown-up menu, and if you’re as tight as me you won’t want to pay for the ungrateful midgets to eat off it either. ££: On the upper of mid-range. £7.25 – £8 for starters, £14.25 – 25.50 for a la carte mains £7-8.50 for desserts. Sunday lunch is £26 for two courses, £31 for three.